(As an unrepresented Green Party supporter) This would prove there is a God! Saanich voters take note - Your vote could be the deciding factor for or against a Conservative majority - Please vote accordingly; don't regret your 'X' after the votes have been counted! Another one: what if the BQ is crushed (e.g. 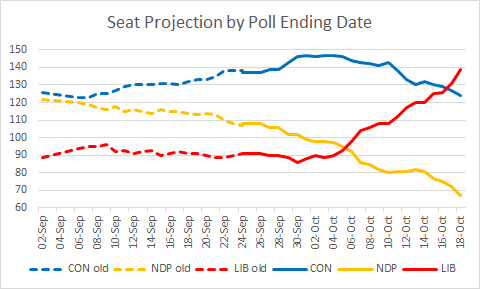 losing party status and/or its leader) -- could we see BQ defections to the NDP, which would then, conceivably, become simultaneously the new Quebec nationalist party AND Canada's government? 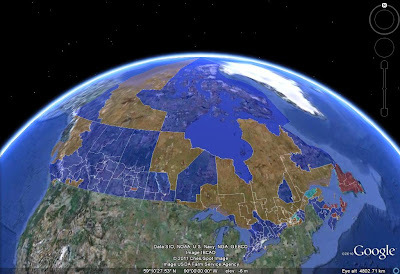 How far are most of the NDP Quebec candidates from BQ positions on federalism? I think it will go as Conrad Black has predicted in a recent National Post article. In case of Tory minority, Bloc will support the reintroduced budget that includes $2B HST compensation for Quebec. As long as lib+NDP does not have majority, Bloc will hold the balance of power. I fantasized about that unlikely scenario ... but with an even number of seats, could one Green member have a balance of power? Doen't seem mathematically possible. Saanich-Gulf Island is the only riding in Canada where the Greens have a legitimate chance to get a candidate elected. I think that all the progressives in that riding should vote Green come Monday. Let's end this nonsense of not having the Green Party represented in Ottawa once and for all. For the rest of the country vote NDP! Frankly, I don't see the Liberals wanting to crawl into bed with a Layton-led coalition. (You don't know where he's been! HA!) If they did, I don't think that all of the caucus would go. I also don't see why the Greens would want to be boxed-in with any other party or group. I live in Saanich and lawn signs in residential neighbourhoods indicate Greens will probably win the seat. Also the one poll I heard of had the Greens with a modest lead. As I mentioned before in one of your previous posts (I think), if the Tories get around 153 or 154 seats, perhaps there is a scenario where Harper can lure a few 'blue' Liberals into an agreement to support his government for four years. 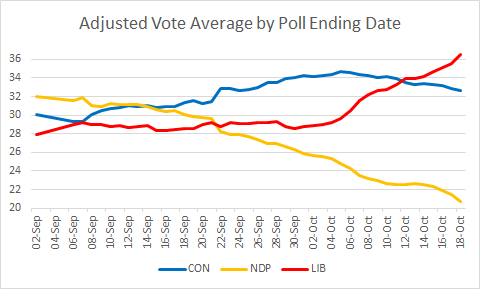 These 'blue' Liberals, assuming there are any left, would see an NDP government way worse than a Harper majority. EKOS post coming. Projection already updated. I'd be very surprised if the Liberals as the third party enter into a coalition with the NDP (or the Tories). That would be suicide. But that doesn't stop the Liberal group from supporting a Tory minority vote by vote, or if the Tory policies aren't supportable to support the NDP on a vote by vote basis. That actually makes the Liberals pretty important (assuming the Bloc is devistated)balance of power to use as a tool to rebuild and to regain some credibility. Lots of factors a play though. In 2008 Harper made the opposition coalition/arrangement inevitable by proposing to eliminate the dollar for votes subsidy to federal parties. When he backed off, the necessity for the coalition evaporated. Note: cancel dollar for votes equals 'coalition'. Early or mid campaing (I can't remember which) Harper confirmed (and what a stupid thing to do) that if he had a majority, he would repeal the dollar for votes arrangement; at the same time he challenged Canadians: there are only two options ... a Tory majority or a 'coalition' government. I know the impact that Harper's pitch had on me ... total horror. What do you think? Could this combination of issues have sparked the electorate to produce its own 'coalition', choosing Layton over Ignatieff, perhaps, because of the Tory hate campaing? And could this 'coalition' surge have become simply a vote for change and reform? Or am I just being a naive tree hugging idealist? Phil: Nah, Quebecers started this whole thing because they were tired of the Bloc. Before the movement in Québec, the NDP was lower in English Canada than in 2008, even after the debate. I think the greens will take that seat, one of the reasons she decided to run there because they did their internal polls and found that was where she could win. Dont forget how much of a run she gave Minister Mckay in the last election although that was because the liberals did not have a candidate there. I just think May knows something and thats why she decided to run there against another conservative minister. Actually, it is well known that Sannich Gulf Island is the only place in Canada where entire poll boxes were full of green ballots. That has happenned tima and again in the so-called Gulf Islands where some peoplke live their ecological dream and do without being connected to the power grid. The problem for the Greens lies on Vancouver Island, the Saanich part of the riding where votes have been split between all four parties. But May, if she does not win, will finish a close second.